In addition to using the time tracker, you can also add and review time using a special Timesheet view. To use it, click Workspaces in the sidebar, then Settings, and there enable Timesheet. Timesheet view is a much quicker method for adding time and is perfect for employees who are used to filling their timesheets manually at the end of the day and need to enter a lot of time at once. Simply select the projects/tasks you were working on during the week, and fill time for each day. Add a task from a project you were working on. Write how much you’ve worked on that task each day in the week. Time Tracker and Timesheet share your time data. So, if you add time via Time Tracker, you’ll see that time in the Timesheet, and vice versa. All users can edit or delete their time, as long as it hasn’t been locked. You also delete time by clicking on the X. If you delete time entry in the timesheet, it will delete all the time associated with that task for that week, so be careful. If you want to add a description or tag to a time entry, use the Time Tracker. Time added through the timesheet inherit their project’s billability status. If you wish to change billability status, use the Time Tracker. Once the Timesheet view is enabled, Project becomes a required field automatically and can’t be turned off (meaning all time entries must have a project before they can be added). Also, Description and Tag can’t be selected as required fields. Copy last week: If you work on the same tasks day-to-day, you can copy over the projects and tasks from your most recent timesheet, without any tracked time. 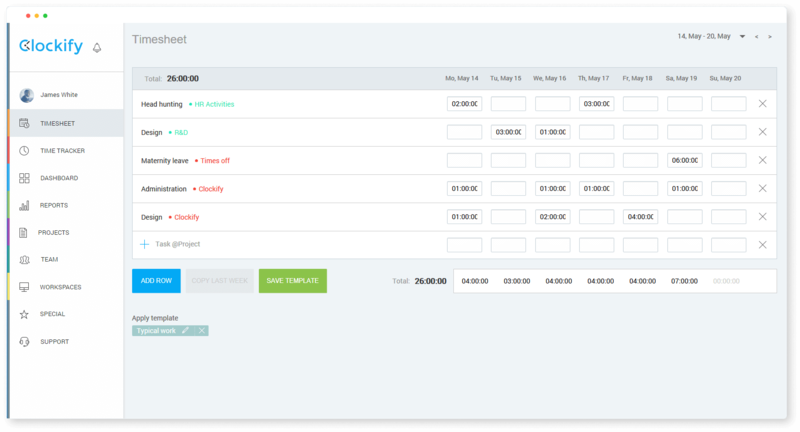 Templates: You can save a timesheet with tasks from any week as a template. Then, when your timesheet is empty, click on the desired template at the bottom, and your timesheet will be populated with all the tasks from the template. Copy last week, and templates are only available when you have an empty timesheet for the selected week. If a task doesn’t contain any time, it will disappear after reload. Note: Adding time for others is an extra feature, which you can enable by upgrading your account. 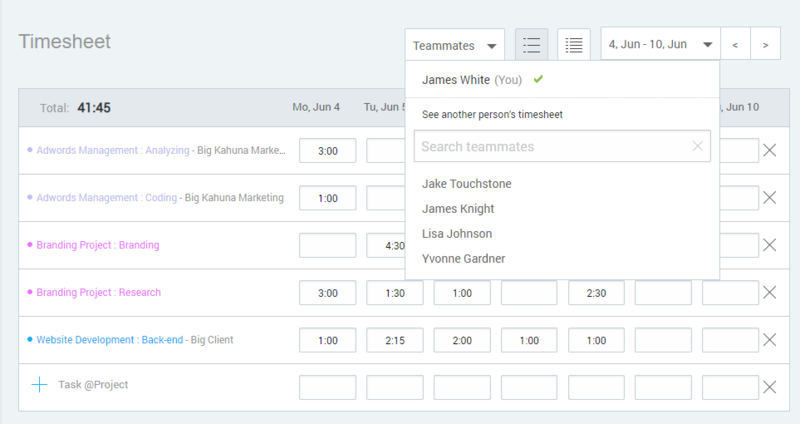 Only owner or admins can see, add, or edit another person’s time entries in the Timesheet. Regular users can only edit their own time entries.